in a wired or wireless manner. 1. 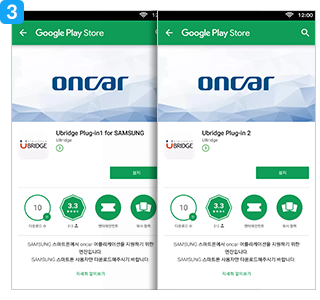 After downloading oncar app on your smartphone, plug a USB cable into the phone. 2. 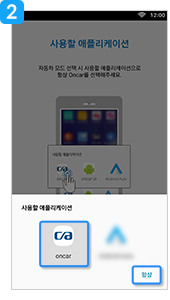 Tap [OK] on the USB accessory related pop-up and select oncar in the ‘complete action using’ pop-up. 3. Refer to the manual on the smartphone and install both Plug-in 1 and Plug-in 2. 4. Permit the following settings on the smartphone. 5. 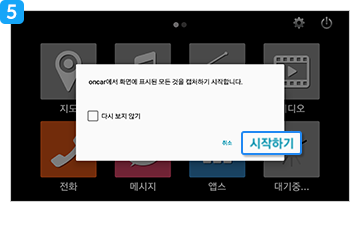 Tap [Start now] to allow capturing screen and start oncar. * The setting process can be different depending on smartphone versions. 1. 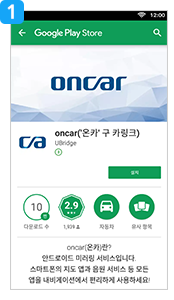 Download the oncar app on your smartphone. 2. 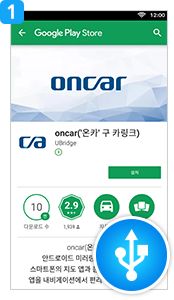 Run the app and select oncar in the ‘complete action using’ pop-up. 5. Tap [Start now] to allow capturing screen. 6. Check the Wi-Fi hotspot name and its password on the smartphone. 7. 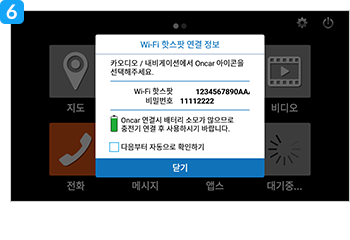 Run oncar on a car display and search the Wi-Fi hotspot of the smartphone. 8. Choose the smartphone hotspot name in the Wi-Fi list. 9. Enter the password shown on the smartphone. *The setting process can be different depending on smartphone versions.